At breakfast this morning, I asked that age old question. Yes we discuss dinner at breakfast. After the feeding frenzy at the super bowl party this weekend, we were all fooded out. We attended a big party in a friends barn/game room. Chicken wings, chili, potato skins, jambalaya, hot dogs, swedish meatballs, macaroni and cheese, turkey ruben sandwiches, beans and franks, pizza and assorted chips and dips. So needless to say we needed something light and clean for dinner. It was my Son, the carnivore, who suggested having salad. Now I couldn’t just serve some lettuce leaves on a plate. Within an hour of dinner they would all be rummaging around the fridge looking for more. It had to be a salad with some sustenance. 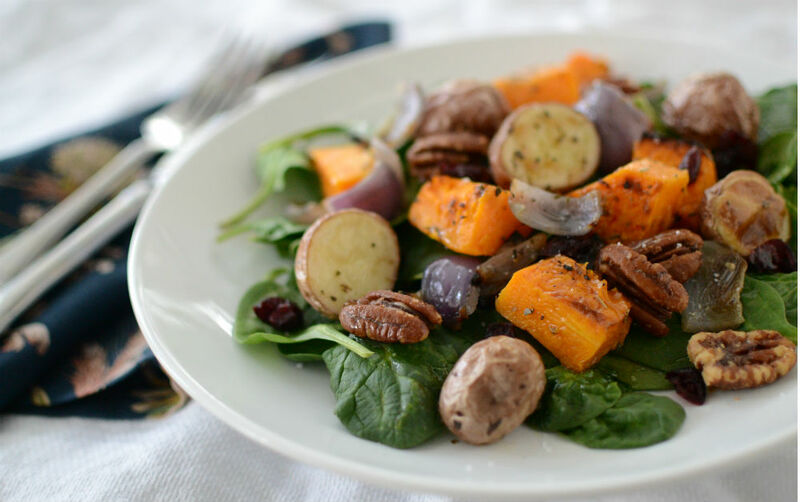 Spinach salad with butternut squash, roasted red potatoes, caramelized red onion, and some candied pecans. I added to that some big hunks garlic bread. No one here was complaining that was for sure. With tomorrow’s nights dinner already planned. I guess we will have to discuss the weather and current events at breakfast tomorrow. In medium bowl toss pecans with melted butter, cayenne, brown sugar and salt then place on sheet pan. Roast for 10-15 mins, or until nicely browned. Set aside. To another sheet pan add cubed squash, potatoes and red onion. Add 2 Tbs of the olive oil and give a give toss. Season with salt and pepper and herbes de provence. Note: Cut squash 1/3 larger than size of potatoes since it cooks faster. Note: placing squash, potatoes and onion separately on sheet pan you can easily remove one if it cooks faster than the others. Bake for 35-45 mins until squash is soft and caramelized in spots, and potatoes are fork tender. In large serving bowl add spinach, whisk together remaining 4Tbs of oil with lemon juice and a bit salt and pepper and toss well. Place on serving platter and sprinkle crasins and pecans then top with roasted vegetables.